This is a glimpse of how Dalston could look if plans for a multi-million pound scheme to redevelop Kingsland Shopping Centre are approved. Plans drawn up by developers Criterion Capital are in the early stages, with an on-going consultation taking place by public exhibition at the shopping centre. An aerial shot of how the large site diagonally positioned opposite Dalston Junction Station shows the popular Dalston Eastern Curve Garden replaced with a planted thoroughfare. Although no formal plans have been submitted by the developers some local residents remain concerned by over development of the area and loss of greenery, one of the keys features of the areas desirabilty. Others are looking at the positive impact of an increase in job opportunities, living accommodation and improved amenities. Any redevelopment would be likely to involve bulldozing the existing shopping centre to make way for 14-storey apartment blocks as well as new retail space, and it is unclear how overshadowing from tall buildings might affect Ridley Road Market. "Others are looking at the positive impact of an increase in job opportunities, living accommodation and improved amenities." 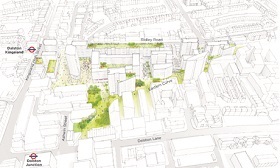 Earlier this month the council gave the green light to a scheme by Transport for London and Taylor Wimpey to build high rise apartment blocks on the Dalston Western Curve former railway land next to Dalston Junction Station.